2015 was a year of leadership transition for the APALRC. 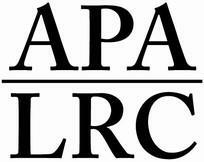 On August 16, 2015, Zenobia Lai ended her tenure as the executive director of the APALRC. During her four years as the APALRC’s executive director, Ms. Lai enhanced the program’s mission and the legal services provided to the Asian American Pacific Islander community residing in the Metro-DC area. Her dedication to ensuring that low-income Asian immigrants receive much needed legal assistance was the catalyst for the APALRC to take on more challenging projects. Ms. Lai’s successor, Naznin Saifi, has over 20 years of legal services experience and is committed to the mission of the APALRC and to continuing the expansion of services provided to the low-income AAPI community. 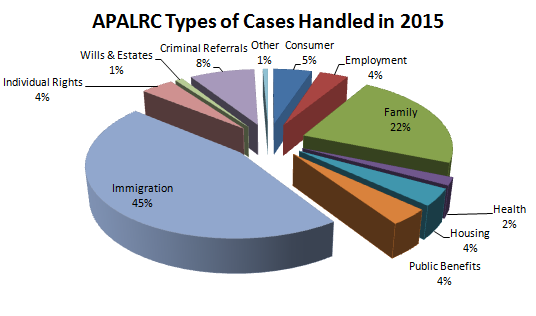 The APALRC staff of four attorneys and one program assistant provided legal assistance in 625 cases during 2015. We assisted victims of domestic violence obtain orders of protection and legal immigration status to free them from their abusers; represented low-income housing tenants in their fight to save their subsidized housing complex; and filed U and T visa petitions on behalf of victims of crime and human trafficking, providing them with the means to regain their dignity. In addition, the APALRC became part of the New Americans Campaign, helping over 100 legal permanent residents, some of whom also require disability and/or fee waivers, become U.S. citizens. In 2015, the APALRC helped clients who immigrated to the U.S. from countries across Asia and who spoke 16 different languages and American Sign Language. AYUDA’s Community Legal Interpreter Bank, the interpreters in our Legal Interpreter Project, and our dedicated volunteer attorneys and legal interns ensured that we were able to assist Metro-DC’s growing Asian community.